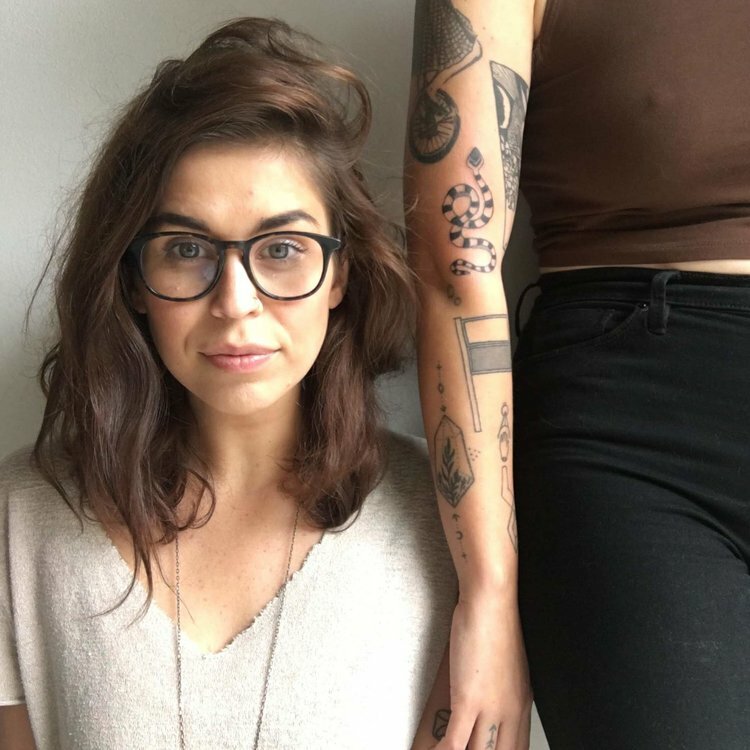 Shara Crosby lives in Greenville, South Carolina, is originally from Asheville, North Carolina, and gives hand poke tattoos of her own design. After being inspired by the work of Tea Leigh, Shara taught herself the ancient craft by giving herself and her friends tattoos, and the practice quickly became her catharsis. Her intention is to hold space for others; setting up a tattoo experience where she is fully present and the recipient is safe to have their own process as she permanently marks their body. Marlee and Shara discuss the different feelings of tattoos from men and women tattoo artists, self-taught and apprenticed tattoo artists, totally unique designs for individuals and repeat images, and relent on a few less-than-magical tattoo experiences. Shara also has a full time job and is grateful to have it, while she simmers plans to eventually open a studio that will be a safe and sacred space for tattoos, massage, herbal consultation, rest, and healing. She knowingly talks about learning your boundaries (i.e. how much time you commit) in a day job versus the craft you practice after hours. Shara took the first two days in residence to not do anything, she took the time to face herself and the things facing her at home. Then she was ready to start meeting people and hand-poking tattoos. She was booked up with appointments right away, and spent the tattoo sessions getting to know the person she sat with. After a week of being in a space where her only obligation is to take care of herself and tattoo people, Shara realized that this is something that she wants to do with her life, and will take that intention home with her. Sleeping in and getting rest has taught her so much. Love! Marlee wows at the ease-fulness of falling in and out of love this year. Fiction Books! She is getting back into fiction and is reading The Good Girl- reading fiction is a great way to not always be working. Love! Receiving a package from a sweetheart while you are at an artist residency is the bomb. Season two of Stranger Things! Marlee and Shara have big love for Winona Ryder. Finding your path! Shara is gonna go home and poke everyone, and sleep and self-love in between. Becoming a birth doula! Share is taking her Dona workshop when she gets home.